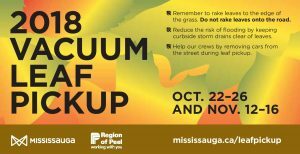 During the fall, the City of Mississauga provides Vacuum Leaf Pickup service to streets that are more than 35 years old and contain many mature large trees. Streets with fewer and younger trees are not included in the program. Addresses eligible for Leaf Pickup will receive a direct-mail notice that indicates when leaves will be picked up in their area. Check the Leaf Pickup Route Map to view dates and find out if your street will receive Vacuum Leaf Pickup.